Dr. Ray Lauk is an international speaker, entrepreneur, educator, and comic who speaks on entrepreneurial leadership, communication through storytelling, school improvement, organizational culture and climate, and building organizations that fuel growth through learning. A graduate of Chicago’s Second City Improv comedy program, Lauk has performed improv, stand-up comedy, and storytelling throughout the United States, Spain, Bangkok, and Rio de Janeiro. Lauk holds a Ph.D., an MBA, and a Master’s in Education—all from the University of Illinois at Urbana-Champaign. He is an adjunct professor at the University of Illinois at Urbana-Champaign, Concordia University in Chicago, and at The College of New Jersey’s International Master’s Program in Bangkok. Lauk spent most of his career as a school superintendent in Illinois public school districts and overseas at the American School of Brasilia, Brasil. Lauk is the former Education Vertical Marketing Manager at GE Security. His book, FUEL for Learning, teaches school leaders to implement some of the critical components of the GE culture to improve schools. As a student teacher in Boulder, CO, Lauk’s supervising teacher told him that he was going to teach Lauk “how to teach or how to make toffee.” He did both. Lauk has been making toffee for over 30 years—mostly for family and friends at the holidays. In 2014, Lauk decided to produce and sell his toffee commercially. As an entrepreneur, Lauk is the owner of Dr. Ray’s Toffee, LLC, and he produces Chicago’s finest toffee sold through specialty gourmet stores, at regional markets throughout the year, and internationally through the website www.drraystoffee.com. Lauk speaks at the intersection of entrepreneurial leadership, school improvement, and effective communication through storytelling. While his content is serious, his presentation style draws upon his background as a stand-up and improv comic. Lauk understands that authentic learning occurs when participants are engaged, active, laughing, and fully present. Lauk guarantees a most remarkable program unlike any that you have previously seen—and assures you that your goals will be met. · The five cultural behaviors that leaders can learn to immediately improve their organization’s outcomes and results. · The elements of effective storytelling along with practice integrating stories into their presentations, sales pitches, and speeches. Participants receive immediate feedback and support to become more effective, impactful, and memorable speakers. · The seven behaviors of entrepreneurs that make your organization more robust, dynamic, and successful! Dr. Ray Lauk is committed to making your program a fantastic success! His speaking fees and travel expenses are negotiable within certain ranges depending on your needs, budget, and schedule. Please contact Dr. Ray Lauk at 630-802-1992 or by email at rlauk@rlauk.com. 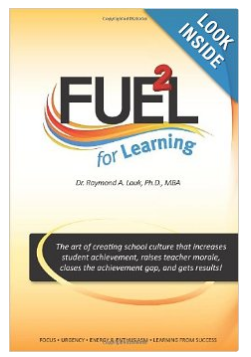 FUEL for Learning explains how to create a school culture that achieves results! Dr. Ray Lauk, a former Illinois and overseas school superintendent, explains how his experience at GE has transformed his approach to school improvement. FUEL for Learning is a proven formula for improving classrooms, schools, and school districts! Read dr. Ray Lauk's blog on entrepreneurial leadership, storytelling for leaders, and related topics by clicking here!